I can’t believe it’s Thursday already. I have been so busy working on my living/dining room that I haven’t posted since last week (bad, bad blogger). I’m not ready to share any of my living room yet (you can get a peek of my progress on Instagram), but I do have a small trick that I used in my bedroom to hide my Ipad and phone cords. 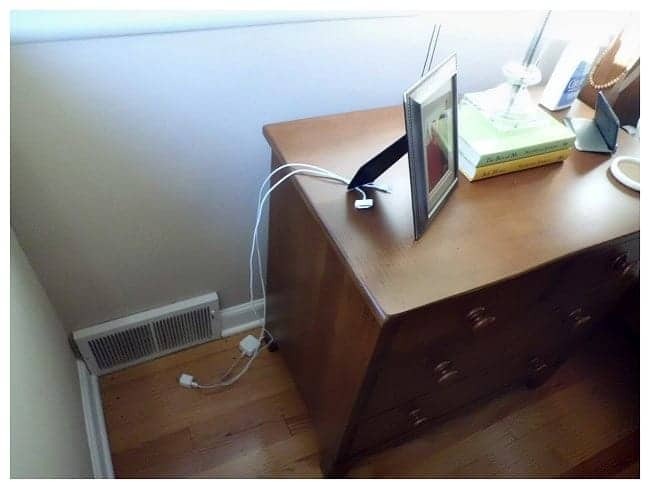 I keep my phone in my bedside nightstand at night and I use my Ipad to read, so I needed the plugs to be near so I could charge my devices. 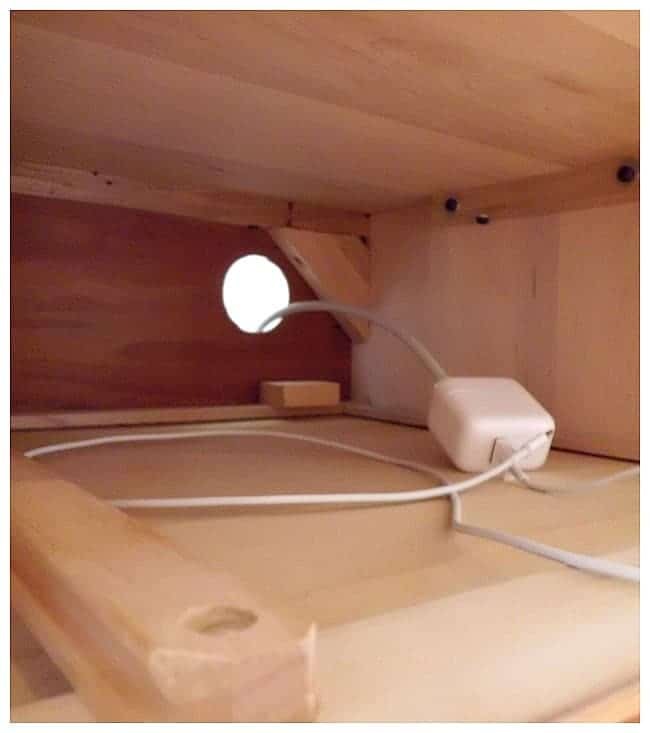 I have just had them laying on the floor and I would trip over them or not be able to reach them, so I decided to cut a hole in the back of my nightstand so the plugs could slip through and plug-in the outlet that is behind my bed. They would be in the drawer and out of sight and out-of-the-way and they would be easy to reach. This was a really easy project to do and only took a few minutes. 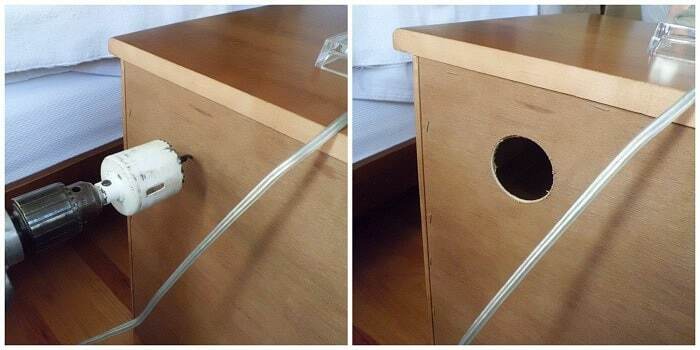 I took my husband’s hole saw and put a hole in the wooden back of my nightstand. The hole was pretty big but you just need it to be big enough for the chords to stick through. I stuck the cords that were plugged into an outlet, through the hole and put the drawer back in. That’s it…easy and free!!! Now I can charge my phone and Ipad and I don’t have to look at the cords or trip over them. And here is a sneak peek of one of the projects I’m working on in my living room. Come back next week to see everything I have done in this room. 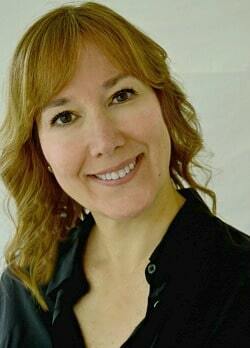 Please follow me on Pinterest, Facebook and Instagram. What a great idea! I love the idea of having things handy, but no cords all over the place. Thanks for the idea. You’re welcome KC. I’m kinda a neat freak so stuff like phone and computer cords laying around bug me. Thanks so much for visiting.